NOTE: Normally I publish a newsletter after a trip to Scotland or Irelandthus, about every six months. If you would like to receive a FREE newsletter, send an email to me at aferguson@fergusongolf.com. Hello Independent Travelers to Scotland and Ireland!! My last newsletter was largely dedicated to Ireland. This one is Scot-centric because my wife, Ruth, and I just returned from a month-long trip covering 1700 miles in four very different parts of the country. We "self-catered" (rented flats) all the way and enjoyed Scotland in new ways on and off the beaten track. I have played or toured all of these and enjoyed and appreciated each for its distinctive character. Ironically, the best of the bunch, in my estimation, are in the parts of Scotland least traveled by golfersthe west coast and the north. Of particular note, the golf course at Traigh is a "must-do" pilgrimmage for every lover of Scottish golf. Just getting to the far end of the Morar Peninsula is a trip back in time and the journey is rewarded with a day of play on a quirky seaside track featuring no less than six holes with blind first or second shots (as they say, "only blind once"). Pictured here is the first hole with Traigh's simple, whitewashed "clubhouse" in the background. Yes, there's hole up there somewhere! The first hole is a 150-yarder straight uphill across a grassy embankment to a flat, unseen green. I do not have room here to describe all these wonderful courses but, rest assured, they will be in the next edition of Golf in Scotland: A Travel-Planning Guide and I will gladly accept your suggestions for additions to the list. In the meantime, look these up on the web and you'll see what I mean. Feature - The Southern Swing: Scotland's "Lake District without the Crowds" - Speaking of getting no respect, the lower third of Scotland is seriously ignored by visiting golfers. After 10+ years of planning trips for golfers, I can count on one hand the number of clients I've had who have ventured into Scotland's southern regions, the parts of Scotland called "The Borders" and "Dumfries-Galloway." I urge you to consider this region for your next tripespecially those golfers who've played all of Scotland's major venues. The Southern Swing is a loop trip that can be made in either directionout of Glasgow and back to Edinburgh or vice versa. This routing allows you to combine major courses in Ayrshire (e.g., Troon, Prestwick, Turnberry) and/or East Lothian (North Berwick, Gullane, Muirfield) with the relatively unknown courses of the south. Do yourself a favorvisit Scotland's "Lake District Without the Crowds." You'll play some of the best golf in the country for less cost with more local flavor. Club News - It was a tough winter for Scotland and Ireland. Some courses were closed for several weeks in December for the first time in over twenty years. 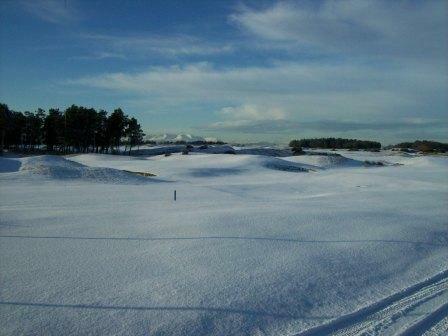 Janice Borys, administrator at Dundonald Golf Club near Troon, sent this wintry scene to me as a reminder that sometimes it snows on the west coast.  Nairn GC will host the Curtis Cup in 2012.  Open venues: 2011- Royal St. George's; 2012 - Royal Lytham & St. Anne's; 2013 - Muirfield. For more information see www.opengolf.com.  Dunbar GC, Gullane #1, and North Berwick West Links will again serve as Open Qualifying venues when the Open returns to Muirfield in 2013.  St. Andrews' Jubilee course will be receiving an extensive makeover over the next three years from the Martin Hawtree group; work is already underway. 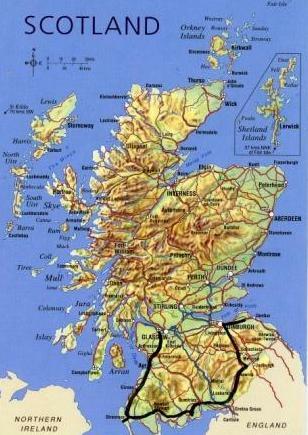 Old Course 2011 - Going to St. Andrews in 2011?. Here's a reminder that advance reservation applications for 2011 Old Course tee times can be submitted after 10 a.m. British Standard Time on Wednesday, September 1, 2010. A second round of advance applications will be accepted in early January to distribute those not accepted in the September round. The website at St. Andrews (www.standrews.org.uk) has been revamped. Speed and navigability are improved, with helpful visitor links to the ballot and advance reservations on the homepage. Focus on Carnoustie  Many of you have enjoyed dinner over the years at my favorite restaurant in Scotland, Belmonte Ristorante and Pizzeria. Sorry to report the restaurant has closed; apparently Maria and Luciano have moved back to Italy. I guess all good things must end.  Carnoustie continues to lead the way on early booking; the diary for 2011 opens August 2first-come, first-served, no special deals, no "elite treatment"is anyone at the St. Andrews Links Trust paying attention?  Lady pros will grapple with the championship course next year at the Women's British Open, July 28-31. The course will be closed for a week from July 24.  Rates for senior caddies have been raised to £45. Look for others to follow if they haven't already.  Management has received permission to proceed with planning for a new building near the first tee to house a pro shop, reception, and changing facility. It may be up and running by mid-year.  The last (and best) of the "golf classics," the Carnoustie Country Classic, is still standing and accepting reservations for 2011 (May 8-12). This great Stableford-format event includes play on Carnoustie championship, Panmure, Monifieth, and Montrose, with a welcoming reception on Sunday evening and an awards banquet on Thursday evening. 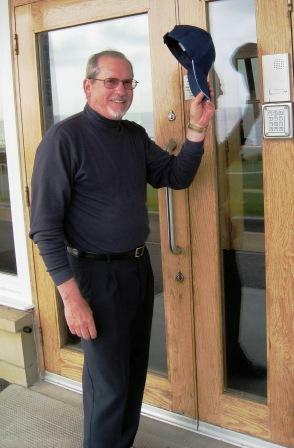 CCC is now being administered by Jan Brodie at Monifieth Golf Club. For more information, see the Events page at www.carnoustiecountry.com or call Jan at 011-44-1382-535-553. Odds 'n' Ends  Drive time around Limerick (e.g., Lahinch to Ballybunion) has been shaved by twenty minutes or more with the opening of a tunnel under the River Shannon.  The Donald Trump soap opera continues apace on the shores north of Aberdeen. They're starting to push dirt at Balmedie but longtime landowners unwilling to sell to Trump continue to foul Donald's nest. Their names are Forbes, Munro, and Milne. Donald Trump ought to take care. People with names like that use to eat Englishmen for breakfast.  At this point, virtually universal second-bag fees (typically $50) on international flights give golfers another reason to consider forwarding luggage. Check rates with UPS, FedEx, DHL. Specialists include www.luggageforward.com and www.theluggageclub.com. 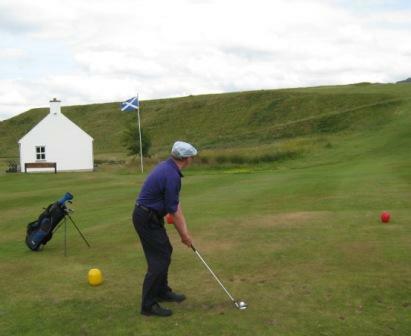  Alternatively, if renting quality clubs appeals, Golf Gear Hire is a new company doing business near Edinburgh. Prices for "premium" sets start at £18/day on rentals of 6+ days. That's about half the cost of club rentals from pro shops. For more information see www.GolfGearHire.com.  Golfweek ratings. A recent issue of Golfweek rated forty best courses built before 1960 and forty best courses after 1960. A sensible dichotomy. The usual cast of characters before 1960: Royal County Down, St. Andrews Old, Royal Portrush, Muirfield, Ballybunion Old, Turnberry Ailsa, Royal Dornoch (7 of top 10 from Scotland and Ireland). Royal Troon, Machrihanish, and Cruden Bay continue to creep up the list as I think they should. In the post-1960 group, 32 of the 40 are in Ireland (17) and Scotland (15). That is as it should be: More courses have been built in Ireland since 1960.  St. Andrews gets all the attention but, arguably, the greatest exponents and exporters of Scottish golf to the rest of the world came from Carnoustie and North Berwick. Now, local citizens of North Berwick, proud of their golf heritage, have developed an informative town map with no less than forty-five sites located where North Berwick's golf history unfolds. You can learn about the likes of Willie Anderson, Ben Sayers, Philip Mackenzie Ross, David Huish, and Catriona Matthew in their informative brochure. Read their inspiring stories online at www.northberwick.org.uk. Brief Advertisements - Remember to check with me for preferred rates with Arnold Clark car rentalScotland's largest auto dealer with the largest fleet of automatic vehicles. I can usually save you big bucks. 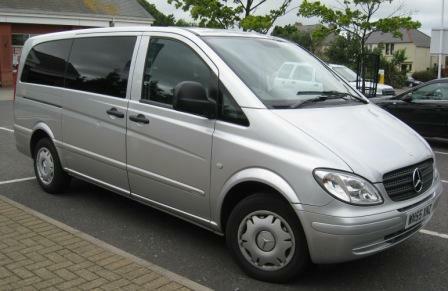 The agency is now featuring the roomy, automatic Mercedes Vito minibus pictured here; it's perfect for four golfers. Call me at 800-835-6692.  Trip Planning 2011 - I will be doing only a limited number of trips with preference given to (1) returning clients and (2) self-catering "stay and play;" and (3) what I consider relatively adventurous trips off the beaten path where my expertise can be put to best use (e.g., see The Southern Swing above).  Finally, a reminder: for updates to Golf in Scotland: A Travel-Planning Guide see the book page on this website. Reviews always welcome at www.amazon.com. If you have friends in golf whom you think would like to receive this occasional newsletter, please forward it with the suggestion that they contact me at aferguson@fergusongolf.com. Our mailing list will never be sold, rented, traded, or otherwise shared with anyone and I promise not to muck up your mailbox with more than two or three newsletters annually.